OTTAWA – (October 26, 2012) Yesterday CFUW joined the Ontario Association of Interval and Transition Houses (OAITH), survivors of violence and other allies, Families of Sisters in Spirit, the Public Service Alliance, and the Canadian Labour Congress in delivering a message to the Government of Canada: Canada needs a National Action Plan to End Violence Against Women and Girls! 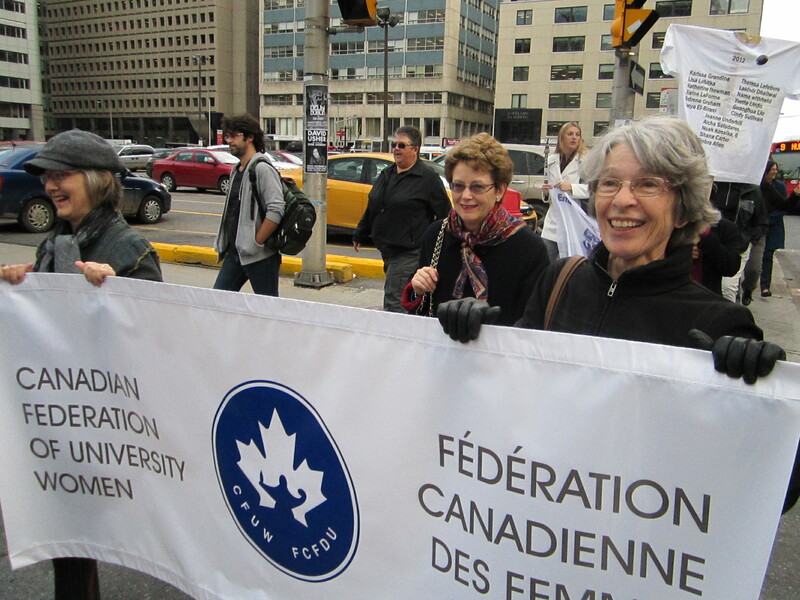 Following a march through the street of Ottawa from the Delta Downtown Hotel to Parliament Hill, we were also joined by Members of Parliament Niki Ashton and Elizabeth May. Liberal MP, Judy Sgro sent her regrets along with a message of support to demonstrators. Violence against women is a persistent human rights issue in Canada, as women remain three times more likely to be killed by a spouse or intimate partner than men, with approximately one woman being killed every six days. In 2011, there were 21,800 sexual assaults reported to police, 85% of which were women, most under the age of 25. However, it is estimated that only 10% of such assaults are reported. Not all women experience violence equally in Canada. Aboriginal women experience much higher rates of violence than non-Aboriginal women and are almost seven times more vulnerable homicide. Young women, women with disabilities, and women belonging to the Lesbian Gay Bisexual Transgender Two-spirited Queer (LQBTTQ) community are also more vulnerable to violence. On any given day, over 8200 women and their children are living in emergency shelters and transition houses to escape violence in Canada. Many shelters operate at full capacity and some must even turn women away. On April 15th, 2010 alone there were over 200 women turned away from shelter facilities because shelters were full. Violence against women has many costs. Not only does violence jeopardize the security, well being and productivity of women, it also costs Canada an estimated $6.9 billion per year in terms of social services, healthcare, and legal aid, among others. A comprehensive, national response is needed to address the root causes of gender-based violence and end all its forms. The United Nations has called on all member states to develop a National Action Plan to End Violence Against Women and Girls by 2015. Several states such as Australia have begun implementing their own National Action Plans. Canada needs to start now. This entry was posted in Uncategorized on October 26, 2012 by cfuwadvocacy.